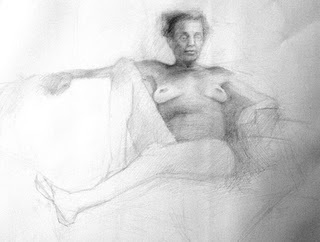 On Sunday I attended Bay Area Model's Guild Drawing Marathon, which is an all-day drawing event held quarterly. They have a room full of models working all day, with different lengths of poses. I worked at the long-pose model stand, so each of these two drawings was 3-hour session.